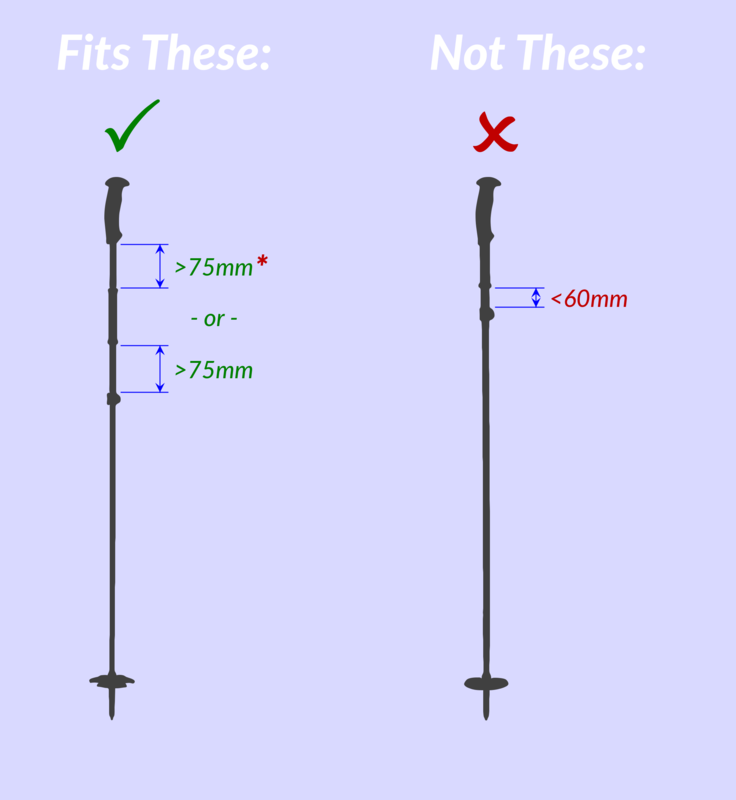 Your pole must be straight and uniform with little or no taper in the upper section of the shaft. Your pole’s cross-section must be circular in the upper shaft area. PoleClinometer now fits ANY diameter ski pole, from pencil-thin to gargantuan, and everything in-between! 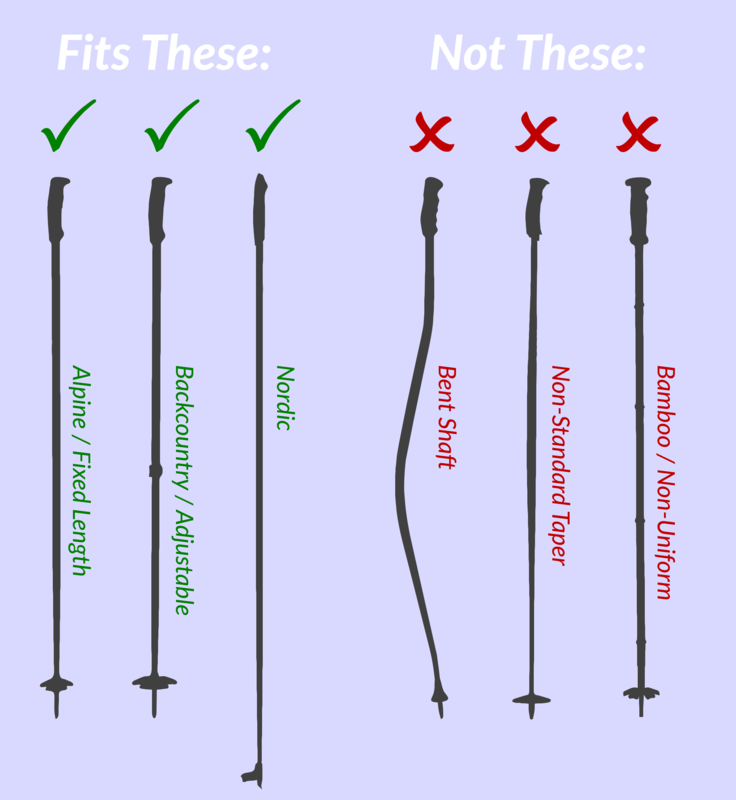 The standard kit fits 14mm, 16mm, or 18mm diameters out-of-the-box, which is nearly all ski poles made. But we now have solutions for the exceptions too. Think you have special needs? Just buy the regular kit, and describe your pole in the order notes. 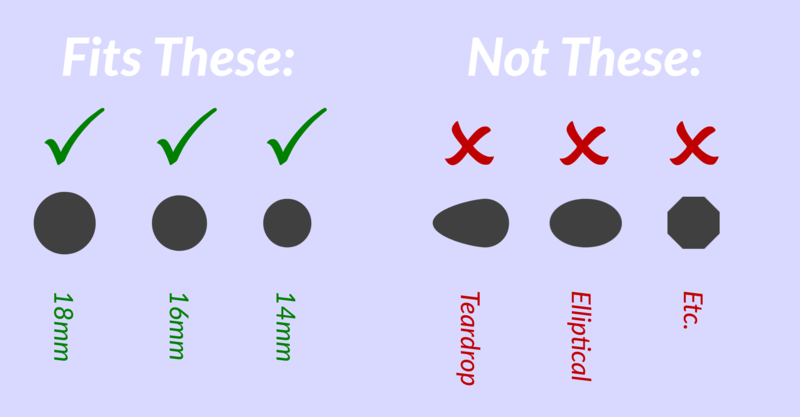 We’ll include the sizing bits you need at no additional charge! Want to measure your diameter to be sure? Try this trick. Don’t want to bother with any of this? Don’t! Just buy the regular kit. It’s almost certain to fit as-is. If you find that it doesn’t, just tell us, and we’ll send you what you need at no charge*! *Including FREE domestic shipping. We may have to charge shipping cost outside USA. Your pole must have sufficient unobstructed space in the upper shaft area to attach the PoleClinometer sticker. Many backcountry poles these days have extra features in the upper shaft area (such as extended grips for for side-hilling) that can sometimes get in the way of a PoleClinometer mount. Consider checking that you have room for PoleClinometer per the above dimensions. If you’re “close but not quite“, you can always trim the sticker vertically to fit, and just give up a bit of measurement range — I mean, how often do you really ski 10° or 60° slopes anyway? *Check the get-it-on page for some tips on getting the protective sleeve in place if you want to install above some non-removable obstacle on your pole shaft.